Cassava (Manihot esculenta, crantz) is a tropical root crop and major staple food, supplying about 70% of the daily calories intake of over 50 million Nigerians. Globally, cassava is consumed by an estimated half a billion people, and also has important application in the animal feed industry. Due to its high moisture content, cassava root is a highly perishable with a post-harvest life less than 72 hours. The estimated post-harvest loss is about 23% for freshly harvest roots. Consequently, cassava roots need to be processed to improve their flavours and reduce post-harvest losses. Cassava products of commercial importance can be classified into primary and secondary products. 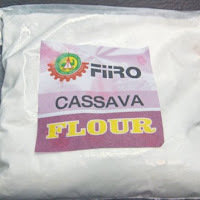 These primary products include gari, gari flour, fufu flour, cassava chips and cassava pellets, while the secondary products are ethanol, monosodium glutamate, glucose syrup, soy-gari, cassava noodles etc. The Institute has extensively worked on cassava processing, even beyond the primary processing level, including developing technologies for the utilization of some primary products, particularly cassava starch and cassava flour to produce such products as noodles, snacks etc. SORTING: The freshly harvested tubers are sorted mainly by visual assessment. Defective tubers and extraneous matters are separated and discarded. WEIGHING: The sorted tubers are weighed with industrial weighing scale. The total weight of the input (raw material) can be recorded. PEELING: The separation of inedible peels from the edible portion of the tubers is accomplished by manual peeling. The peels can be utilized for poultry feed formulation or serve as source of fuel for industrial plants. WASHING: The peeled roots are thoroughly washed with hygienically clean water to remove both physical and biological contaminants, which can adversely affect the quality of the finished product. In addition, free starch is released by the cutting action of the peeling knife or brushing during harvesting. Washing can be accomplished manually or mechanically (using a drum washer). GRATING: After weighing (to calculate the peeling loss) the peeled tubers are subjected to the size reduction unit operation called grating. Ideally, a hammer mill is used to produce a smooth mash which would result in a superior quality product with higher yield. FERMENTATION: The mash is anaerobically fermented in a non-corrosive container for a very short period, (2hrs). From zero hour to the end of the period, the mash is intermittently and vigorously stirred manually or mechanically. This ensures intimate contact of the enzyme (endogenous) with hydrolysis of the cyanogenic complex and maximum liberation of the severed hydrogen cyanide. The process is termed detoxification. GRANULATING: The semi-solid wet “cake” is mechanically size – reduced using a hammer mill granulator. Granulation produces five granules with greater surface-area than cake. DEHYDRATION: Dehydration (or drying) of the fine granules is accomplished through the use of a mechanical (rotary hot air) dryer rather than sun drying. The drying much faster owing to increase in the surface area of the granules. Mechanical drying ensures improved and consistent product quality. The flash dryer is equally good equipment for drying cassava flour. The moisture content of the product is about 8-10%. MILLING: The dried product is milled with a hammer mill to produce a fine powder. SIEVING: The powder is sieved to separate the fibre from the required fine flour (a creamy-white product). 12. PACKAGING: The flour produced is packaged directly or blended with another flour before packaging e.g. Wheat flour to form composite flour.